As Amazon seller, we focus on researching and developing high quality products and provide excellent customer service. We also have the experience and technology to ensure quality. We have Lifetime Replacement Warranty by one year. For any quality problem , we will send you a free replacement or refund for you. ★HIGH QUALITY MATERIAL: This shovel is made of high quality 2Cr13 stainless steel and the handle is made of high quality aluminum,so it is durable and tough enough to do heavy jobs like digging,shovelling or chopping. ★MULTIFUNCTION KIT: This is an all-in-one multi tool,you can use it as a shovel,a hoe,an axe,a saw,a hook,a crowbar,a harpoon,an awl,a knife,a wine opener,a compass,a fire stick ,a screwdriver and so on.In short,it is an excellent helper for you to go to picnic,camp or field survival,and it will help you a lot when you are in emergency. ★ADJUSTABLE AND DETACHABLE: With the screw on the junction of the shovel and the handle,you can adjust the angle of the shovel from 45°to 180°.When it is 45°,it is a hook; when it is 90°,it is a hoe and it turns into a shovel when it is 180°.In addition,its handle is spliced from four sections so it is detachable and you can adjust the length according to your need. ★USER-FRIENDLY DESIGN: This shovel is connected by screw,so it is easy to detach and set up;and the surface of the shovel is polished by hands,which makes it look upscale;the pine tree shape sandblasting pattern on the shovel makes it full of beauty;what't more,the handle is treated with oxidation treatment so it is full color and high quality;With the innovative knurling process treated surface,the handle is anti-slip and comfortable to hold. 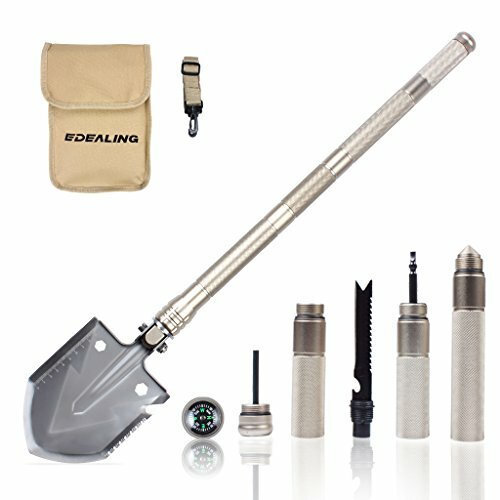 ★PORTABLE SIZE: With the high quality tactical storage bag,you can put the detached shovel into the bag and carry it with you outdoors because the size of the shovel is very compact after being detached. If you have any questions about this product by edealing, contact us by completing and submitting the form below. If you are looking for a specif part number, please include it with your message.